Abstract. This paper presents the Meso-NH model version 5.4. 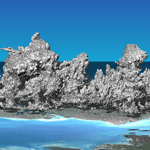 Meso-NH is an atmospheric non hydrostatic research model that is applied to a broad range of resolutions, from synoptic to turbulent scales, and is designed for studies of physics and chemistry. It is a limited-area model employing advanced numerical techniques, including monotonic advection schemes for scalar transport and fourth-order centered or odd-order WENO advection schemes for momentum. The model includes state-of-the-art physics parameterization schemes that are important to represent convective-scale phenomena and turbulent eddies, as well as flows at larger scales. In addition, Meso-NH has been expanded to provide capabilities for a range of Earth system prediction applications such as chemistry and aerosols, electricity and lightning, hydrology, wildland fires, volcanic eruptions, and cyclones with ocean coupling. Here, we present the main innovations to the dynamics and physics of the code since the pioneer paper of Lafore et al. (1998) and provide an overview of recent applications and couplings. How to cite: Lac, C., Chaboureau, J.-P., Masson, V., Pinty, J.-P., Tulet, P., Escobar, J., Leriche, M., Barthe, C., Aouizerats, B., Augros, C., Aumond, P., Auguste, F., Bechtold, P., Berthet, S., Bielli, S., Bosseur, F., Caumont, O., Cohard, J.-M., Colin, J., Couvreux, F., Cuxart, J., Delautier, G., Dauhut, T., Ducrocq, V., Filippi, J.-B., Gazen, D., Geoffroy, O., Gheusi, F., Honnert, R., Lafore, J.-P., Lebeaupin Brossier, C., Libois, Q., Lunet, T., Mari, C., Maric, T., Mascart, P., Mogé, M., Molinié, G., Nuissier, O., Pantillon, F., Peyrillé, P., Pergaud, J., Perraud, E., Pianezze, J., Redelsperger, J.-L., Ricard, D., Richard, E., Riette, S., Rodier, Q., Schoetter, R., Seyfried, L., Stein, J., Suhre, K., Taufour, M., Thouron, O., Turner, S., Verrelle, A., Vié, B., Visentin, F., Vionnet, V., and Wautelet, P.: Overview of the Meso-NH model version 5.4 and its applications, Geosci. Model Dev., 11, 1929-1969, https://doi.org/10.5194/gmd-11-1929-2018, 2018. This paper presents the Meso-NH model version 5.4, which is an atmospheric non-hydrostatic research model that is applied on synoptic to turbulent scales. The model includes advanced numerical techniques and state-of-the-art physics parameterization schemes. It has been expanded to provide capabilities for a range of Earth system prediction applications such as chemistry and aerosols, electricity and lightning, hydrology, wildland fires, volcanic eruptions, and cyclones with ocean coupling.